Members of the CHEOPS consortium could be proud of their achievement as the science instrument of the upcoming exoplanet mission left Bern on its journey to Madrid last month. The science instrument and its tailor-made handling equipment left Switzerland by truck in six containers, designed to provide protection from shock, moisture and dust, on 10 April 2018. Its safe arrival in Spain the following day marked a key milestone for the CHEOPS project and enabled Airbus Defence and Space Spain, the prime contractor that has designed the spacecraft, to integrate the science instrument and the spacecraft platform and begin test activities. The science instrument, including among other elements the telescope and Charge Coupled Detector, or CCD, cannot operate without the satellite platform, which comprises solar panels, thrusters, radio transmitters and reaction wheels for providing power, propulsion, communications and attitude control. Credit: University of Bern Keeping the instrument free of dust. The shipment of the science instrument follows an intense period of qualification and calibration activities at the University of Bern, with the instrument team racing against the clock to deliver the instrument to the spacecraft prime contractor so that CHEOPS can be ready for launch by the end of this year. The key objective of the calibration campaign was to collect the data needed to convert the signals measured by the instrument into values that can be used to determine astrophysically meaningful quantities. One of two CHEOPS plaques that will carry children's drawings into space. CHEOPS will make observations of exoplanet-hosting stars to measure small changes in their brightness due to the transit of a planet across the star disc. The light from point-like stars will be collected by the telescope and directed onto multiple pixels of the detector to form an image that astronomers call the 'point spread function'. Knowledge of the shape of the point spread function is needed to make sure that the instrument is used in an optimal way. It is essential that any changes in the measured signal caused by transiting planets can be distinguished from changes caused by environmental effects such as variations in the temperature of the instrument or electromagnetic disturbances. The calibration campaign conducted in Bern over the past three months involved such sensitive measurements that even the body heat of people in the cleanroom housing the reference sources had to be taken into account. Reassuringly, it was determined that the thermal stability of the telescope was satisfactory and even exceeded the design requirements. Thermal vacuum chamber and calibration set-up at the University of Bern. A number of calibration activities focused on the electronics of the CHEOPS detector. As photons from CHEOPS target stars strike the silicon surface of the CCD, they will be converted into electrons. The resulting charge will be turned into a voltage that must be sampled and digitised. The response of the electronics in this process is unique to CHEOPS and must be calibrated and optimised. As a result of the tests completed in Bern, astronomers believe that the CHEOPS instrument can achieve the scientific objectives for which it has been built, and it is with hope and excitement that they can look forward to the new science that the satellite will enable once operating in space. Once the final integration checks have been made in Madrid and the last calibration data have been analysed, most members of the instrument team in Bern will be able to consider their job done. After much hard work, they will be looking forward to the launch eagerly. Others will continue work on the remaining elements of the mission, starting with the team at Airbus Defence and Space Spain. The upcoming activities will provide an opportunity to train the future operations team and will include system validation tests to ensure smooth end-to-end operations involving the integrated spacecraft, the mission operations centre in Torrejón, Spain, and the science operations centre in Geneva, Switzerland. 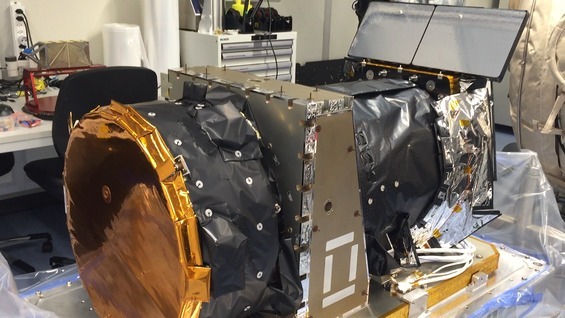 These tests will be followed by thermal tests in France, vibration tests in Switzerland and acoustic tests at ESTEC, ESA's technical centre in The Netherlands.